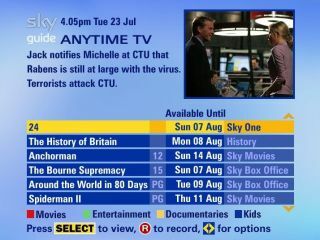 Sky has announced it's Anytime on TV on-demand service. It will be available to Sky HD subscribers initially, with latest-generation Sky Plus boxes being included in the "coming weeks". The service can only be used on boxes with internal hard drives because the content is pre-loaded onto the box rather than streamed live. That's different to other on-demand services such as those from Virgin Media or BT Vision . Both of those service stream truly 'on demand' content after a few seconds queuing time. The lack of true-on demand content is down to the limitation of the satellite platform. But Sky will surely knock any worries over technology out of the water with its content. It boasts a mix of entertainment, sports and movies content that the others simply don't. The service will surely be used as a driver to get standard Sky Digital subscribers to upgrade to Sky Plus or Sky HD. 30 hours of on-demand content will be automatically downloaded to the box overnight. The space for the on-demand content has long been available on Sky boxes. 160GB Sky boxes, for example, have a partitioned hard drive where the first 80GB is for personal recordings, the rest earmarked for 'future developments'. Boxes will be upgraded automatically so viewers can access the service. Owners of updated boxes can go to their TV guide and press the well-worn red button to access the Anytime on TV listings. Viewers have seven days to watch downloaded programmes. And, as newer programmes are downloaded, older ones are automatically deleted. "Anytime on TV helps our customers get even more out of Sky by presenting them with highlights of the weeks' programmes to watch on demand - shows that they might not otherwise have found," thinks Sky's product director Stephen van Rooyen. Sky says it will make further content announcements in the coming weeks but, for now, the on-demand service includes programmes from Sky One, Sky Movies, Sky Sports and Sky Arts. Other channels include National Geographic, The History Channel, Disney and Turner. It also includes content in HD for relevant subscribers. Sky Anytime is already available on the PC and mobile phones. Anytime on PC hosts around 1,000 hours of programming. Sky Mobile TV is a subscription service with over 28 live and made-for-mobile channels.